Seems like a cool project! Out of curiosity, are there any enemies that retain their behavior from SMB2, or are new enemies just reskinned? As the thread title says, I am looking for some gfx people if you wanna help out with the hack! That castle level you just showed seems rather interesting, @Yoshin. I like how it requires all four directions of movement, rather than just two like in most Mario levels. One thing I'd recommend working on is putting more thought on how you use enemies and features. There are some interesting uses of features, such as the sparkies with the ? Blocks, but what I mean is that right now enemies and obstacles seem to be scattered around the level without much thought. 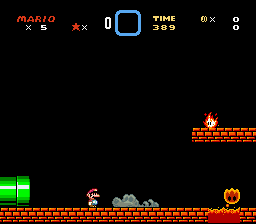 In the official Mario games, levels are usually built with a theme or gimmick in mind, along with a list of only a few stuff that can be used. Those levels mix and match what is used and build upon them as the player progresses on them. Limiting yourself to only several stuff per level may seem restrictive at first, but I think it allows more creativity and can make the levels more memorable. Let's take Chocolate Island 3 from SMW for instance. 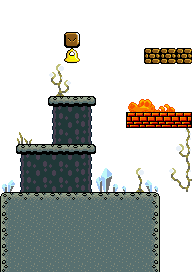 The level revolves around the rotating platforms that were seen in previous levels. Soon, we see Koopa Troopas walking on the blocks that hold the platforms, which makes the player a bit more cautious when traversing the level. Later on, the level mixes things up by replacing the Koopas on the blocks with Fuzzies, which are more challenging to avoid in this situation. 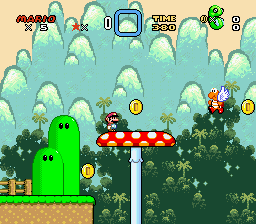 Koopa Paratroopas are also encountered in a couple areas, to make some interesting challenges that must be overcome. So, what this level did is take a familiar element and mix it with a couple enemies, creating interesting combinations and a memorable level overall. Aside from level design, I'd like to say that some of the graphics look nice. They do look a bit out of place when mixed with the vanilla SMW sprites, but I assume that will be fixed later on, since you're looking for artists. Anyway, I hope my advice was helpful to you. Good luck on this hack! @Syaxamaphone Yeah, I do agree with you there. I also feel like the cloud platforms are out of place in this kind of setting. The rope platforms seem to act identical, so those could be used instead (although they would need some additional tiles for the edges so there wouldn't be a cutoff). Either that, or a new, suitable jump-through tile could be made. Platform inconsistency is def not intended, as the castle gfx I'm using are far from finished(as are most things, as the thread title implies). The enemy placement is mostly adhoc to get a feel for things, the final gimmick for the level will likely involve conveyors(all the bridge tiles will be replaced with these) and sparkies, but yes overall the stuff is pretty random and I'll admit that, even if my reasoning sounds like an excuse. As for the other point, I just wanted to test out lunar magic's new feature where you can have levels with weird shapes and see what I could make out of it. Now that's a walking animation. Cute pic. What does the Yoshi's Cookie do? It's a nice animation, I must say! The latest picture also looks good; I like how there's a number 9 made out of coins. Are those seaweed supposed to be enemies or background scenery? The Yoshi cookie looks like it might be rather interesting. I'm liking what's going on here. The design of your levels reminds me a lot of my ol' Games Factory days. I'm not saying it's a bad thing--It's just super nostalgic for me. Slow progress but progress is progress!